What Size of Stand Up Paddle Board Should I Get? After you have enjoyed the sport of standup paddle boarding or SUP, you may decide you want a board of your own. There are a number of factors to consider in order to choose the right board to suit your needs. First, you need to decide the aspect of the sport in which you want to participate. If you paddle board to get or stay in shape or just for fun, you will more than likely stick to locations having calmer, flat water with maybe smaller waves. 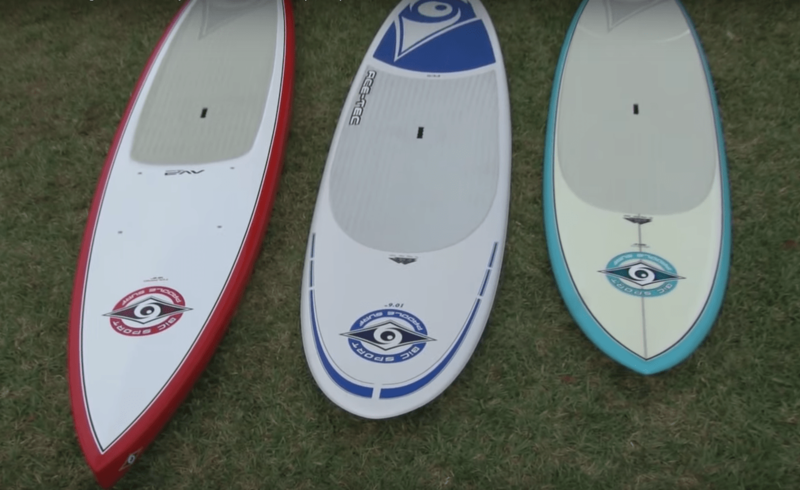 If you plan on getting into long distance or racing paddle boarding, You need a board capable of going greater distances with ease, or a board that effortlessly careens through the water. Along with length and width, hull type, construction materials, fin and hull types must all be considered. Boards under nine feet in length are considered short and are typically used for surfing. Children’s boards are commonly around eight feet in length. Boards spanning nine to 12 feet in length are categorized as being medium length and are perfect for all around use. This type of board might be used on calm lakes, or to go surfing. Boards spanning 12 to 14 feet in length are categorized as long boards and are preferred for long-distance touring or racing. Although short boards are easier to maneuver, long boards track straighter and move faster through the water. Board width has a lot to do with the overall stability of the board. Narrow boards average 29 to 30 inches in width and are designed for speed. However, they are not as stable as boards measuring 31 or more inches in width. The wider boards also more readily accommodate people having different body types. Standup paddle boards have either a displacement or a planing hull. Displacement hulls feature a pointed bow or front end, which is designed to efficiently cut through the water. The water naturally displaces down along the sides of the board. This type of hull is made for speed. These boards are also generally longer and narrower. However, they tip easier. Planing hulls are more like a surfboard, flat, rounded and wide. The design makes the board stay on top of the water’s surface, and thus, is ideal for surfing. The overall shape of the board also makes it more stable. These boards are commonly used by beginners or recreational paddlers. Fins are necessary for stability and tracking. Some boards have a large, single fin positioned in the fin-box slot and secured using a nut and a screw. The slot enables the fin to be moved back or more forward as desired. Some SUP models have a three-fin design known as a thruster. The fins enable straighter tracking in calm water or when surfing. The two side fins are often removable. Racing fins are straighter and stiffer, which enables longer boards to glide through the water or to remain stable in bigger waves. Inflatable SUP boards come with either attached flexible fins or removable semi-rigid fins. The core of a SUP either consists of EPS foam, polyurethane foam, is hollow or is inflatable and uses air. EPS foam cores are encased in fiberglass and epoxy resin or carbon fiber and plastic. Polyurethane foam cores are heavier than EPS, which makes them the material of choice for beginner boards. Mid and high-end boards often have hollow cores, which decreases overall weight and enhances performance. Inflatable SUP boards are lightweight and easy to store yet durable. 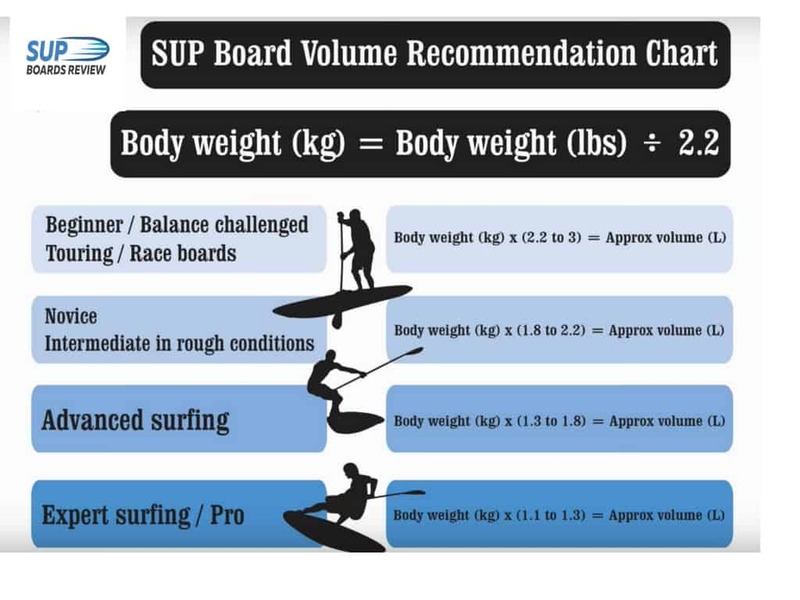 If a board does not have the correct volume and weight to accommodate your body type, the board will not support your weight or displace water correctly. A board’s volume is often expressed in liters. The higher the number of liters, the more weight the board is capable of supporting under specific conditions. Short boards with a high volume are often preferred for surfing as opposed to long boards with lower volumes used for racing. Each board also has a weight capacity, which is displayed in pounds. Paddle – When buying a paddle, select one that is six to 10 inches taller than you. Life Jacket or Personal flotation device (PFD) – As the U. S. Coast Guard considers paddle boards as vessels, passengers are required to wear a personal flotation device and carry a safety whistle. After dark, paddlers must also have some type of light. Leash – Leashes are typically sold separately. The device tethers the rider to the board, which keeps the board within reach should you fall into the water. Leashes come in different styles for flat-water, lake or river paddling or for surfing. Carrier or Rack System – Unless using an inflatable device you store inside your vehicle, you need some type of car rack carrier. Although there are SUP racks available, you might also use padding or foam and utility straps to secure the board to the roof of your vehicle. It is good to know you options when it comes to purchasing a paddle board. Size plays a part depending on your skill level and what you plan on using it for. Don’t limit yourself to thinking you can have only one board. Many of us have multiple boards for multiple uses. Previous Post: « Which Stand Up Paddle Board Should I Buy?